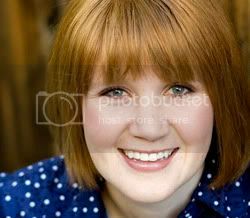 Are you all loving Pinterest as much as I am? I love finding new ideas, crafts, and especially - recipes! 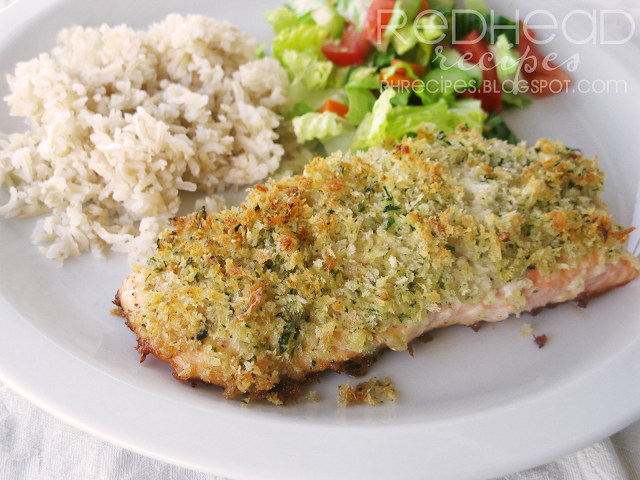 I found this recipe for Panko-Crusted Salmon from Annie's Eats there. It is delicious and easy. Plus, it is done in about 20 minutes! We have made it twice since my mom has been here. It is probably my favorite Salmon recipe I have made! Preheat the oven to 425˚ F. In a small bowl, combine the panko, parsley, lemon zest, salt and pepper. Drizzle with 2 tablespoons of the olive oil and toss with a fork until the crumbs are evenly coated; set aside. Place the salmon fillets skin side down on a work surface. Generously brush the top of each fillet with the mustard and then season with salt and pepper. Press the panko mixture thickly on top of the mustard on each fillet to help the panko adhere. Transfer the pan to the preheated oven for 5-7 minutes, until the salmon is almost cooked through and the panko is browned. Remove from the oven, cover with foil and let rest 5-10 minutes. Serve warm with fresh lemon wedges. I would say I am sorry for my lack of posts for the past few weeks -- but I can't. I have been having way too much fun playing with my mom and, as of Cinco de Mayo, with my new baby boy! He is adorable. We are totally in love. My husband finished his finals Wednesday and, for medical reasons, I was induced Thursday. Everything went very well and both of us are doing great! 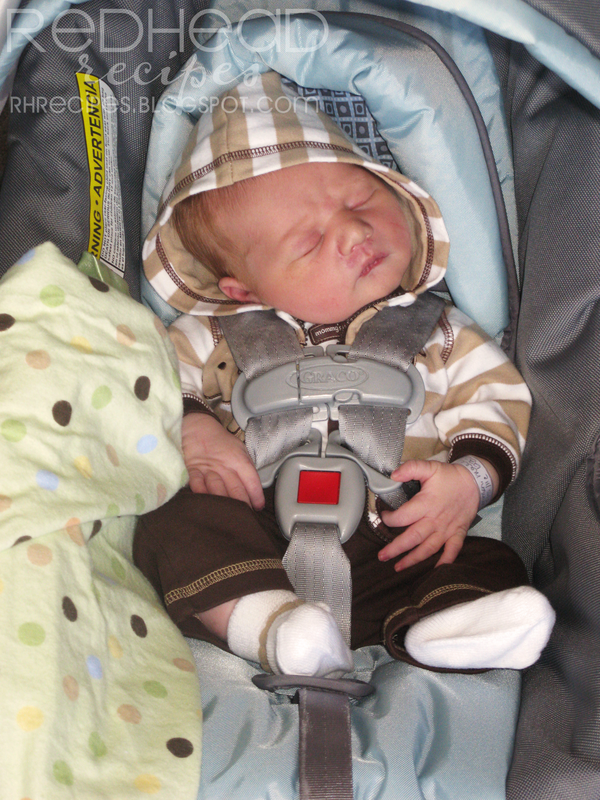 This picture is from his first car ride - coming home! And for those who like stats, yes, he is a big boy - 9 lbs 8 oz at birth, is now over 10 lbs! He is already really into eating! The cheeks are just getting cuter!